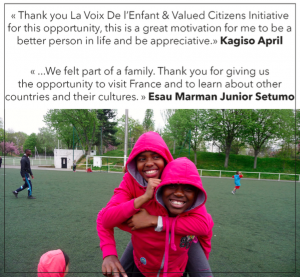 Un grand merci à Noluvo, Junior, Lebone, Mitah, Kagiso, Karabo, Sana & Mabandla pour leur chaleureux retour ! The South-African delegation shares its impressions of 6th edition of the Fraternity Cup…. A big thank you to Noluvo, Junior, Lebone, Mitah, Kagiso, Karabo, Sana & Mabandla for their warm feedback !